Do I have to have an account to search the SMD? You do not need an account to search the database. However, if there is excessive searching then we may need to restrict this is some way. Why do I have to have an account to add details to the SMD? In this day and age where there are so many worthless spammers around we have to have some restrictions on who can add information to our database. If you know a spammer, do the world a favor and turn them over to law enforcement. Why should I add details to the SMD? The SMD was created to help swine breeders, owners, researchers and veterinarians to research and develop treatment plans for all pigs everywhere. The more information entered into the database the ore information is available for everyone and the faster pigs can be treated in to future. What happens when I submit a case? Once you have submitted a case it will go on a queue for our staff to review. After reviewing the case our medical staff will decided whether we have enough information to publish the case or not. If we don’t we will contact you and ask for that information, probably by getting you to update the case and resubmitting it. Once this process is completed will will release or reject the case. Will I know whether my case have been accepted for the database? – Yes! Once the review process is complete our staff will decide to reject or approve the case. Either way you will receive an email indicating our decision. If I remember something to add to my case after I have submitted it, what do I do? 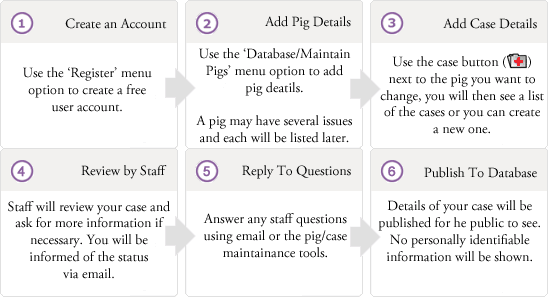 You will be able to use the ‘Maintain Pigs’ menu option under the ‘Database’ menu to list all of the pigs you have added to the system. Next to each is the ‘case maintenance’ button, which will list the cases associated with that pig. You will be able to see the status of each case and if it is not currently being processed by a staff member, you will be able to make changes to it. What do the status ‘Confirmed’ and ‘Confirmed-A’ mean? Confirmed simply means that the case has been reviewed by our medical staff and has been found to be accurate and medically sound. Unconfirmed means that there may be some areas of the case that are less than medically sound, but the general details are deemed helpful for the public. If the ‘-A’ suffix is present then this indicates the record has been transferred from the Duchess Fund database. Usually in this case there is less information available as the old database was very restricted. All information on this site belongs to the SMD unless otherwise noted. Your continued use of this website indicates your acceptance of our service agreement.